I used to be the worst packer when it came to going away for a trip or holiday. I’d either start packing two weeks before going, getting really stressed and packing everything but the kitchen sink, or leave it all until the last minute and forget all the essentials. Either way I’d find the whole process really taxing and was probably the worst part about going away somewhere. Anyone else used to feeling like that? Thankfully now I’ve streamlined the packing process to somewhere healthy in the middle, where I’m organised but practical and I don’t fill with dread staring at the empty suitcase on the floor. I used to find all the products and suncreams the worst as, even though I’m not a huge make up user if I’m going somewhere hot and tropical, I still like to have my favourite beauty essentials while I’m away, as well as a few skincare products that I know aren’t going to make my skin flare up or cause a heat rash when you’re out in the sun all day. There’s also something comforting about having your favourite and most trusted beauty products to hand when you’re thousands of miles away from home. Or even when you’re just away for a weekend, you know you can relax and still look and feel your best. I can highly recommend taking some of your favourite and most trusted beauty essentials with you next time you go away, (and even better if they come in a handy travel size, even easier to pack in your bags), so I thought I would share a few of my favourites (some I’ve been using for years), hopefully helping you to streamline your travel beauty bag. I’ve been using Clinique foundations for years now. I’m not the most adventurous with trying different foundations and I’m by no means an expert beauty blogger when it comes to telling others what they should be wearing, but this one has to be my hands down favourite, and if like me you like a little built in glow (not too much) then you might like this one like me. I don’t normally wear a full face of make up if I’m away somewhere hot (and lets be honest, applying make up to your face everyday does get very tedious), so it’s nice to have a break when you're on holiday, and embrace your own face, especially when it’s 90% humidity, on a beach somewhere, not really worrying about how you look. But saying that, I do still like to take a foundation away with me, so I have the option,and come the evening, or if I’m going away on a weekend city break somewhere, I’ll always still apply some of this Clinique one. The foundation has a sheer coverage, but enough to cover, which I like, and it also gives you a bit of a glow (always nice when you’ve got a bit of sun on your face, or even when its cold to make it look like you HAVE seen the sun), and it also has a built in SPF 15. This is always handy if you’re wearing this everyday and you forget to apply sunscreen first. (Don't do this somewhere really hot and go out for breakfast like I did in Bali, and end up getting burnt to a crisp...always wear your sunscreen kids). I normally always use an SPF 50 on my face during the summer and when I’m away on holiday or travelling. I normally let that dry first then apply this over the top. The foundation comes in a really lightweight, easy to pack bottle too. So slim enough to take in your carry on bag, or if I want to condense down even more, I'll put a little bit in one of those mini travel pots, if I’m just going somewhere for one or two nights. All in all, it’s a great travel beauty essential and I always take this one with me wherever I go. Definitely give this a go if you're looking to try something new in the way of foundation that's suitable to wear on holiday and pack in your travel bag. I always like to take a mini perfume in my travel bag when I go away somewhere. It’s a lovely feeling having a favourite scent that reminds you of home when you’re traveling on a long flight or just tired from a day of traveling, there’s something comforting about a favourite fragrance. I never take a full size bottle as I’m always worried that the bigger bottle will smash and there goes £70s worth of your favourite perfume, so a mini version is the perfect solution. Most fragrance companies make the minutures of your favourite scents (you might just have to do a bit of online digging to see where you can buy them, or I’ve often contacted the companies direct, and they will tell you where you can get one from). The airport is also really good for mini perfumes as they often do different sets that you can’t pick up elsewhere so I always look in Duty Free at the airport. One of my all time favourites, has to be Daisy by Marc Jacobs. I always go back to this floral scent and the iconic Daisy bottle is always a lovely item to have in your travel bag. This is a bit of a random one, but this Soltan Kids Protect and Moisturise sun cream is something I’ve used for years. I always take it with me if I go somewhere hot, and its always in my bag throughout the Summer months. As it’s a kids suncream, it’s got the maximum protection that you can get with an SPF, SPF 50+ and also a five star UVA and UVB rating, which I love. It is quite a thick suncream, so you don’t want to put on too much (as long as you have enough coverage to stop you burning) but it is easily absorbed once it goes on. I always apply this to my face (I normally let it dry before I put my make up on) then just top up as I need to go. It’s already a handy travel size so there;s no need to faff putting it into a smaller container for your travel bag. It’s also at the cheaper end of the sunscreen spectrum, so I don’t mind if I slap it on a bit (better to have more than not enough) and you can also apply anywhere, so arms and legs too, which is handy when you’re out and about. Really love this as a staple suncare product in my travel bag, which we all know is super important! 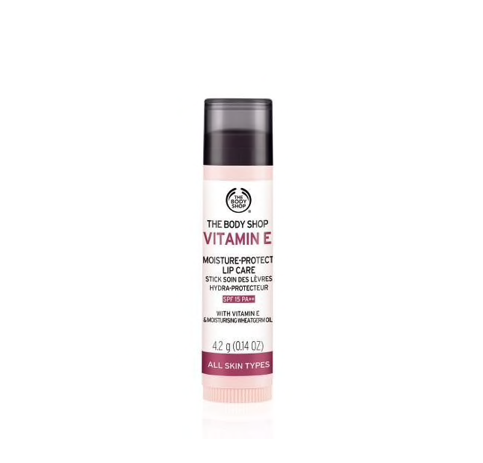 This Vitamin E lip balm from The Body Shop is another classic that I’ve been using for years. It doesn’t just go with on my travels, I pretty much keep one in every handbag and use it daily as its the perfect lip balm to just pop on alone or under lipstick. I’ve used products from The Body Shop since I was a teen. (who else used to buy the character products that were based around endangered species? I used to love these) And you know whatever you buy from them is always made from good quality ingredients and is kind to the environment. Again, I really like that there’s a built in SPF 15 (so easy to get those lips burnt in the sun too) and its great if you have super sensitive skin like me as its really mild (I always find some of the cheaper lip balm brands just make my lips red and sensitive if I use them everyday) but this one is fine to pop on whenever you feel like it. A great little lip balm to take on a long flight too when the air dries everything out, and I like the fact that it travels easy as its in a stick form, and not a pot, which is so much more hygenic when you’re out and about on your travels. I only discovered this Deep Sleep Pillow Spray from This Works last year, when my mum got it for me as a gift, when I was having a busy and stressful few months studying at Shillington. I wasn’t sleeping very well from all the early mornings and late nights cramming to get work finished so I wouldn’t fail my course, and it really helped relax me of an evening and help me drift off to the land of nod. This gorgeous smelling pillow spray really DOES work, and I was surprised that it did actually live up to the hype. Before you go to sleep, you just spray a little over your pillows and onto your bed sheets, and it leaves the most loveliest lavender scent, which is instantly calming and not a fake lavender smell, a natural subtle one that just helps wind down before you go to bed. I’ve since taken it away with me when we did our big Bali trip at the start of this year, as it’s great for the plane (we all know how hard it is to sleep on those things) and also when you’re staying somewhere other than your own bed, it’s nice to have a familiar scent, I always finds this helps when you’re sleeping in a hotel. The This Works packaging is gorgeous too. I like its simplicity and also that it’s not a glass bottle, it’s little and light to pop into your travel bag. Last but by no means least are these really useful 911 rescue patches, Pack Your Bags, from Tarte Skincare. These awesome gel patches were first introduced to me by my gorgeous friend Lyanna and they really are little miracle workers if you have tired or puffy eyes. I definitely suffer after long journeys or flights, so I always have a set of these in my bag, ready to use whenever I get to where I’m going. (I’m not quite brave enough to wear them in public on a flight yet, but pretty sure if you did they would be amazing). You pop these on under your eyes and you instantly feel a cooling/calming effect (even better if they have been chilling in the fridge beforehand), brightening the under eye skin and reducing the appearance of dullness and fine lines. They’re made of gel infused with coconut oil and algae and just feel lovely when you put them on. Again being quite sensitive to products, I found these to be super gentle (Tarte Cosmetics are cruelty free, vegan and free from all the yucky stuff) and they left my eyes feeling all refreshed and smooth. They are a little more expensive but well worth the money. You also get 4 sets per pack, which is plenty if you just use them for trips long haul, a great staple for your travel beauty bag. And there you have it, my 6 travel beauty essentials to pop into your travel bag. I’d love to hear what your favourite travel beauty must haves are, so feel free to leave me a comment as I’d love to see how these compare to yours. You can also see what else I’ve been using or buying over in the beauty section of the Wonderlist.